In the Honey Tek it states to use spores. Is there any reason that tissue from the stem could not be used in place of spores? I am going to give this a try and was wondering what everyones thoughts on the matter are. Thank-you for your time and I look forward to your response. Edited by jebus2000 on 09/15/01 07:41 PM. Edited by jebus2000 on 09/23/01 08:36 AM. I a glad to here that you have tried it and it sounds to me like you have done it. If you have a digital cam. I would love to see some pics or it anyone has pics of this I would love to see them posted. What type did you clone? 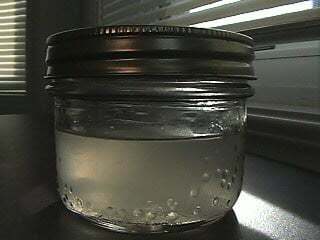 Did you use a large mushroom to clone from b/c from what I understand the resulting "clone water" will produce the same. Please keep me updated o your progress and results. It seems to me that cloning in honey water would be really hard to do without contams. The chunks of mycellium would probably rot before too long. Yes it's possible to do tissue culture useing a liquid culture medium (Honey water, malt/detrose water, potato/dextrose water,dung,ect). They way it done is to "peal" the stripe (stem) to inner core and use this tissue.Just chop it fine ( using blender works best) and add to the culture medium and shake. Store at 75-80F, till growth shows. Adding H2O2 , helps to cut contaments down. Try 1-2 ml per mil. 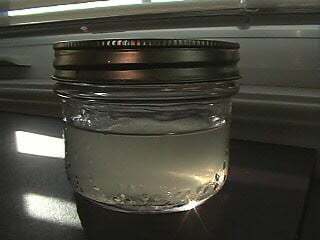 of medium, and cleaning the tissue by dipping it into clean H2O2. Thanks for the helpfull post. I will be posting me results over the course of the next fre days. it is better to use flesh from the inner part of the cap right above the gills. but yes it will work . i just isolated an albino strain this morning. hmmm... thinking now, i think he might be an albino, he's cap was pretty much lighter than usual (my bro thought it wasnt a cubbie at first sight). how do i know if its an albino? I've tried it with no sucess using a glovebox, but take that with a grain of salt... I've failed at pretty much everything I have tried with the execption of BRF jars. Huh! And I was just about to add, a glovebox will greatly improve your chances of success. At any rate, giving your sample a one minute bath in 3% peroxide can also help. My monkey has some mycelium growing in malt dextrose medium that is almost completely colonised. He was wondering if adding peroxide to the solution to make a final conc of 1% peroxide and leave for a few days before innoculating would be of any use or damage to the fungi. He can see a few single cells when he looks down the 'scope at wet slides of the solution and was getting worried. Hes got a large amount of innoculum and doesnt want to loose it!!! Well, think I have done it! I picked a huge shroom and decided to use it to clone. It was 9" tall, big fat stem, with 3" cap. My hope is that by making clone honeywater theat all of the resulting mushrooms will all be the same size. I think that it has to be, as this should be no different then taking a cutting off a plant. They should have identical DNA and therefore only produce big, geneticly identical mushroom clones of the "mother". Anyway, I took a tissue sample from the stem, just about an inch under the cap (Increased chance of sterility) and by using ideas from both the Sterile Tissue Clonning Procdure and the Honey Tek I was able to make three jars of clone honey water! I doubt the pics will show it very well, but in all of the jars there are milky white threads. These were started 2 days ago and no contams....yet. Wish me luck and I will continue to update. hi jebus!!! nice to see your work... it looks just like mine. milky water... after some days i put the h2o2 but i have innoculated 4 pint jars before that and they're smelly now after a couple weeks... (i think something went wrong... lack of h2o2?) 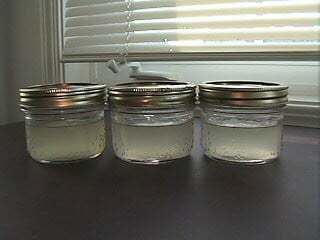 now everything seems alright... mycelium is growing kinda slowly on honeywater jars (too little honey?) but there are small mycelium clouds floating around... i'm gonna give'em another try. Edited by felixhigh on 09/23/01 02:18 PM. 2,808 topic views. 16 members, 69 guests and 10 web crawlers are browsing this forum.